(VOVWORLD) - Vietnam wants to learn from Argentina’s experience in preventing harm from tobacco, alcohol, and non-contagious diseases, as well as in providing first aid and improving public health, said Minister of Health Nguyen Thi Kim Tien. Ms. Tien made the statement at a meeting with Adolfo Rubinstein, Deputy Minister in charge of health at Argentina’s Ministry of Social Development during her visit to Argentina from Friday to Monday to look at Argentina’s health system and share experience in public health. 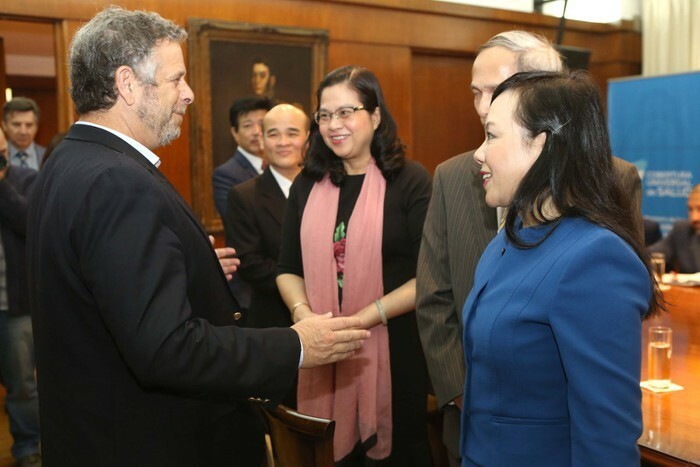 Rubinstein and other health experts introduced Argentina’s health system to the Vietnamese delegates as well as Argentina’s policies for ensuring and improving public health, especially first aid and preventive healthcare. The Vietnamese delegation also had a working session with representatives from Argentina’s leading pharmaceutical companies, laid a wreath at the Ho Chi Minh Monument in Buenos Aires, and visited the Vietnamese Embassy in Argentina.